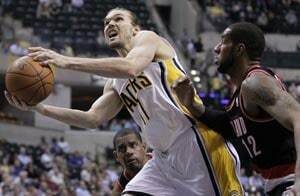 Lou Amundson scored a career-high 21 points to help Indiana beat the Portland Trail Blazers 92-75 on Tuesday, snapping the Pacers' four-game losing streak. Amundson shot 10 for 11 from the field and grabbed eight rebounds for the Pacers. His previous season high in scoring was 11, but he had 13 points in the fourth quarter alone. Paul George, Danny Granger and George Hill each added 11 points for the Pacers. Hill returned after missing two games with a sprained left shoulder. Indiana led by as many as 29 points. LaMarcus Aldridge scored 17 points and Nolan Smith added 10 for the Trail Blazers, who shot a season-low 31.3 percent from the field and made a a season-low 20 field goals. Portland's five assists were the fewest by an NBA team this season.